Never underestimate the simple effectiveness of a horror film's ability to gradually and properly build up its concept. Oftentimes, entries in the genre rush toward the expected scares at such a rapid pace that they neglect how an audience absorbs and processes information, leaving character motivations and the in-universe logic of how the supernatural functions scrambling to catch up. One Dark Night wouldn't be considered a particularly remarkable example of the genre, splicing the old-hat playfulness of sorority hazing with the mystique of psionic electricity and the dead rising from the grave, but writer/director Tom McLoughlin appreciates how the right type of progression and escalation can magnify the supernatural mood. Some iffy ‘80s affectations and a decidedly hollow plot can't detract from the atmosphere generated by the overnight premise and the credible characters, resulting in a slight yet absorbing and mostly convincing jolt of supernatural horror. Following the reported death of occultist Karl Raymarseivich Raymar, in which several other women were discovered at the crime scene, a funeral takes place at a local mausoleum. On the other side of town, reserved yet growingly adventurous high-schooler Julie (Meg Tilly) has been enduring a battery of obstacles in order to join the "Sisters", a purple-jacket-wearin' clique of girls helmed by Carol (Robin Evans). She fits the stereotype of the sororal ringleader, bubbly yet jealous and petty in her treatment of Julie, which reaches a fever pitch once she discovers her deepening connection with ex-boyfriend Steve (David Mason Daniels). In retaliation, Carol decides that the final step to Julie's initiation will involve spending the night inside the local mausoleum, which … you guessed it, so happens to be the resting place of the recently deceased occultist. Thus, a long evening of growing dread begins for Julie, which intensifies once elements of the paranormal begin to emerge from within the mausoleum. After setting an eerie tone with the oddities of the murder scene, Tom McLoughlin pumps the brakes on the film's paranormal thrills, directing its attention to the mannerisms of the potential victims and those with connections to the occultist angle. While the daughter of the occultist, Olivia (Melissa Newman), alongside her wary skeptic of a husband (Adam West), gains exposure to the depths of her father's research and capabilities -- the words "psychic vampires" come up at one point -- the story focuses on layers of justification for the high-school kids to act in the ways they do, a tricky thing since so many horror scenarios can get dismissed simply by them being the product of poor or out-of-character choices. Julie's motivations for wanting to join the Sisters at any cost and Carol's spurned malice toward her make plenty of sense, and it's because writer/director McLoughlin insistently emphasizes the state of their decision-making through passably sincere teenage drama. By the time Julie rolls up to the cemetery in the car with the "sisters", it makes sense. Inside the mausoleum, One Dark Night takes a largely hands-off approach to the inherently gloomy atmosphere of the thick black-and-white marble and lengthy echoic hallways, gradually enhanced by cracks forming in walls and dimming lights that worsen as the evening goes on. McLoughlin wants this to initially feel like a real night stuck in the creepy building, and the stillness in the air while Julie explores her surroundings achieves that effect, with only the knowledge of the occultist's burial place closing in on her as a terrifying factor. The pacing could've taken a hit while she wanders through the mausoleum -- and, granted, it still does to a degree -- but McLoughlin helps that along by revealing Olivia's discoveries about her father at the same time. What does impact the intensity of the thrills is the unnecessary usage of hallucinatory drugs, which casts doubts on the validity of certain imagery and contrives subplot elements that conveniently assist the story in dire situations later on. 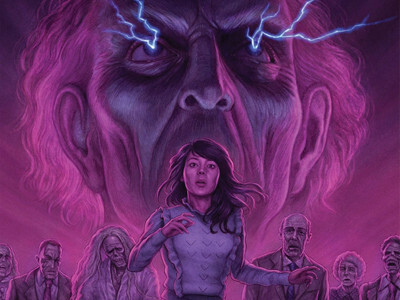 Immersed in pink lighting and eerie shadows leading into the increasingly dangerous corridors, One Dark Night eventually arrives at the point where it transforms the mausoleum from a psychologically taxing maze into an outright house of horrors. Sharp practical effects generate bolts of lightning, decaying flesh, and floating bodies that culminate into a wild climax for the clues and buildup throughout the film, though the scale remains comparatively small and confined to the location and the specific evening. The steadiness and restraint of McLoughlin's buildup also translates to the caliber of its thrills, though: regardless of the impressive low-budget construction providing macabre eye candy, the scares themselves end up low-key, anticlimactic, and too neatly wrapped-up once all's said and done. For its duration, however, One Dark Night lures those watching into a distinctly pragmatic yet entrancing atmosphere that, unlike many contemporary horror flops, puts ambient due diligence above hasty shock value with an agenda. One shouldn't get too flustered with the quality of the first few minutes of One Dark Night, the footage paired with the credits, which are plagued with ‘80s haziness, print damage, and cumbersome contrast. The switchover from the rough footage and the remastered film happens in a blue-cast, dark bedroom, and the jump in quality can be quite staggering, framed at 1.78:1 in a 1080p AVC endcode. Sure, it isn't perfect: print damage does continue to pop up throughout, contrast can be bulky and overbearing, and film grain clumsily mingles with digital compression.. However, the strengths vastly outweigh the negatives. Skin tones are natural and adaptive to both open-aired exteriors and the shadowy confines of the mausoleum, while sharp bursts of color -- the purple of the Sisters' jackets, the insistence of pink neon light, the bluish crack of lightning -- are bold yet conformed to the aesthetic. Sharp lines are nuanced and free of aliasing, curvier details (folds of jeans, strands of hair, marbling in mausoleum) also project nimble detail response, and textures in stone walls and garments are appropriately preserved. You'll have to roll with a few punches, but the bulk of One Dark Night looks really, really good. That's a good thing, too, because the 2-channel Master Audio doesn't lean so far into the positives column as the transfer. Granted, for a lesser-known, minor ‘80s slice of horror, One Dark Night doesn't sound too shabby at all. Footsteps in the quiet space of mausoleum, quick pecks on the lips, and the sound of a woman placing a rose into a crypt's flower holder are delicately pronounced. While the dialogue struggles with appearing natural alongside the movement of lips, the clarity of the lines remains even and aware of midrange tones. Heartier erects, such as crumbling walls and emergy blasts, have the clumsy twang and bloatedness of the era to ‘em, but they maintain enough composure to coexist with quieter elements. Alongside some popping and distortion at certain points, those positives certainly endure their negatives, with blubbery dialogue clarity and drowned-out special effects. There are many moments where the stereo track gets things mostly right, but overall the sound treatment mostly just tries to keep up with the transfer. Two Commentaries spearhead the extras for One Dark Night, one of ‘em new. Fans of the film will be familiar with the track featuring Tom McLaughlin and Michael Hawes, which appeared on the two-disc DVD Media Blasters release. It's a diligent commentary in terms of anecdotes about how they made their $850K budget work for them, pointing out cameos and explaining how they achieved visual effects. The second track is a new one, featuring McLoughlin and Producer Michael Schroeder. Unfortunately, there's some overlap between the two tracks and the discussed content, but each one has moments and insights that the other doesn't, with the first one holding more general insights than the other. Perhaps more intriguing than the new commentary is a series of Interviews (HD) featuring McLoughlin and his cast and crew. McLoughlin (16:15) shoots through a series of intriguing anecdotes in his fifteen-minute discussion in front of the mausoleum, while E.G. Daily (32:03) takes a practical approach in her discussion about how One Dark Night factors into her rapid-fire career, discussing her relationship with the actors and working with the director for the first half … before moving away from this film and onto others in the second half. Other interviewees include Michael Schroeder (14:42), cinematographer Hal Trussell (18:15), actress and wife Nancy McLoughlin (10:53) -- with dog! -- production designer Craig Stearns (10:40), and makeup artist Paul Clemens (17:07) in interview form and in going through his Scrapbook (3:28). Code Red have also included and carried over the previously available Workprint Cut (1:29:55, 4x3), in rough VHS- caliber quality and sporting the Night In the Crypt title, as well a lengthy stretch of Behind The Scenes (38:53) footage with picture-in-picture moments and a Trailer (2:16, 16x9 HD). One Dark Night might not possess a ton of scares or gore, but the supernatural energy it generates within an isolated mausoleum elevates those instances where scares and gore eventually do emerge. Tom McLoughlin's horror outing plays out more like an evolving supernatural mystery, hinged on a girls' high-school clique hazing a prospective member with a required overnight trip to the museum, a situation that entangled with the recent death of an occultist with potential telekinetic powers.Its strengths lie in the smoothness and eeriness of its progression from learning more about "psychic vampires" and the high-schoolers themselves into the dangers of its setting, and while a few unnecessary elements cast misgivings upon what transpires, the scattered thrills of One Dark Night's final act prove to be an imperfect, yet intriguingly atmospheric execution of its buildup. Code Red's Blu-ray looks surprisingly good and contains a density of extras, including a pair of commentaries and a slate of interviews. Fans will find a great package here, and those in search of a distinctive setting and attitude will find it within. Mildly Recommended.